Beauty at the beach is what you will find at Windcrest Villas oceanfront North Myrtle Beach vacation resort. From the beautifully decorated interiors to the beautiful oceanfront views from your private balcony, Windcrest Villas has sprinkled beauty in every corner of this oceanfront North Myrtle Beach resort. Boasting spacious three-bedroom oceanfront North Myrtle Beach condominium rentals, Windcrest Villas offers incredible amenities to families planning a North Myrtle Beach vacation, such as a full kitchen and a fabulous oceanfront swimming pool. The kitchen is perfect for serving happy hour appetizers and delicious cocktails in the comfort of your own oceanfront North Myrtle Beach condo. Relax on the plush living room furniture or enjoy coastal breezes on your private balcony. Everything you need to create a wonderful North Myrtle Beach vacation is within easy reach when you stay in a Windcrest Villas North Myrtle Beach vacation condominium. Access the large oceanfront balcony from the living room and the master suite and listen to all the beach activity that is just down below. 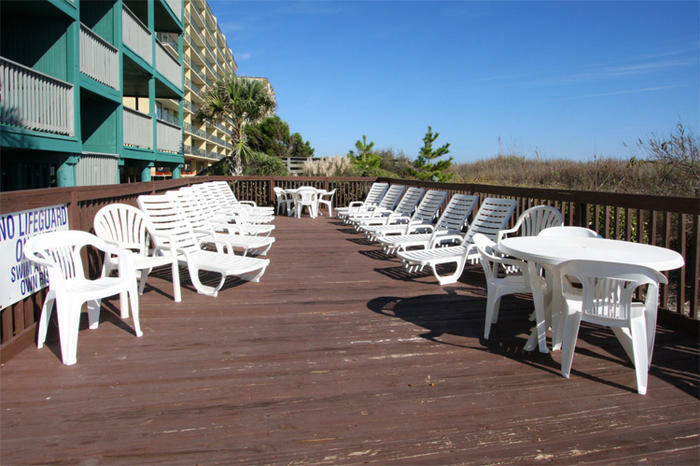 Whether for a moment or for a whole afternoon, the oceanfront balcony is a favorite location to relax during your North Myrtle Beach vacation. All of the oceanfront North Myrtle Beach vacation rentals at Windcrest Villas feature high-speed Internet access. The oceanfront swimming pool at this North Myrtle Beach resort is available for all guests to enjoy and all ages love to splash and play during a refreshing swim, especially when they know that the Atlantic Ocean is only one dune line away. From the oceanfront sun deck, a sandy pathway leads families to the white, sandy beach where building sand castles, surfing the waves on a boogie board and sifting through the sand for gorgeous seashells top the agenda for all families. While there are many great ways to spend your day at the Shalimar oceanfront North Myrtle Beach resort, Myrtle Beach and its famous attractions, golf courses, restaurants, outlet malls and live theatres are only minutes away. Elliott Beach Rentals is not affiliated with onsite management or the HOA of Windcrest Villas.